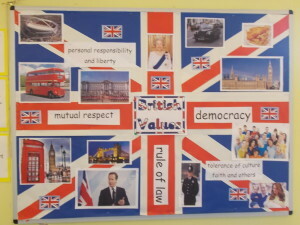 We believe British values are best defined as “democracy, the rule of law, individual liberty, mutual respect and tolerance of different faiths and beliefs” although these values are not unique to Britain alone. We support the rule of English and criminal law and will not teach anything that undermines it. We have a duty to actively promote and embed these values and to challenge pupils, school personnel or parents who express extremist views contrary to fundamental British values. We give pupils first hand experiences of the diverse make up of modern British society by teaching respect of different faiths and cultures. Children have many opportunities for their voices to be heard. In September the pupils choose a charity of the year. Pupils present to the school their reasons why a particular charity should be chosen. After a week of presentations the whole school votes in a democratic election. We have a school council which meets half termly to discuss issues raised by pupils in their class. The council has its own budget and is able to genuinely effect change within the school. The importance of Laws, whether they be those that govern the class, the school, or the country, are consistently reinforced throughout the school day, as well as when dealing with behaviour and through school assemblies. Pupils are taught the value and reasons behind laws, that they govern and protect us, the responsibilities that this involves and the consequences when laws are broken. St Mary’s is situated in an area which is not greatly culturally diverse; therefore we place a great emphasis on promoting diversity with the children. Assemblies are regularly planned to address this issue either directly or through the inclusion of stories and celebrations from a variety of faiths and cultures. As a school we celebrate Divali, Harvest, Christmas, Easter, Chinese New Year, Hanukah, Ramadan and Eid. Our RE and Collective worship teaching reinforce this. Children visit places of worship that are important to different faiths. The whole school and parents attended our Remembrance Service at St Mary’s Church Mucklestone, to commemorate 100 years since the end of World War One. The children had prepared poems, songs and prayers. Wreaths were laid by the roll of honour to remember those from the local community that sadly lost their lives fighting for our freedom. During our focus on Faith day in November 2017 we looked closely at Advent, Hanukkah and Divali. The children were able to experience each of these celebrations through art and craft, dance and food tasting. We discovered why and how the festivals are celebrated all over the world.